Want to learn more about Youth Change Workshops? We don’t want to brag but here are just a few of the many awards and kind words that have come our way over our two decades as a leading provider of professional development throughout North America. Look at all the organizations, groups, agencies and people who say that Youth Change Workshops really does have some of the newest and best strategies to turnaround troubled, delinquent, challenged and problem youth and children. Come to a live workshop, get some of our books, download an online class or sign up for our free professional development resources. Hopefully, you’ll agree that Youth Change Workshops really does a good job of serving teachers, counselors, juvenile justice workers, psychologists, principals, social workers and school guidance staff. When it comes to K-12 professional development training and resources, Youth Change Workshops is working hard every day to set the gold standard for best practices in this arena. We care about you and your students and work hard to give you the best resources for them that exist anywhere. Get completely up to date on our latest achievements and accomplishments in our News section, or, read a few of our many press clippings. Here’s what has been our most exciting development over the past few years. Our oh-so-cool posters have become a huge shining star for us as they continue to grab the media spotlight over and over again. They have appeared in movie after movie, and TV show after TV show in both the U.S. and Canada. in her column each issue. 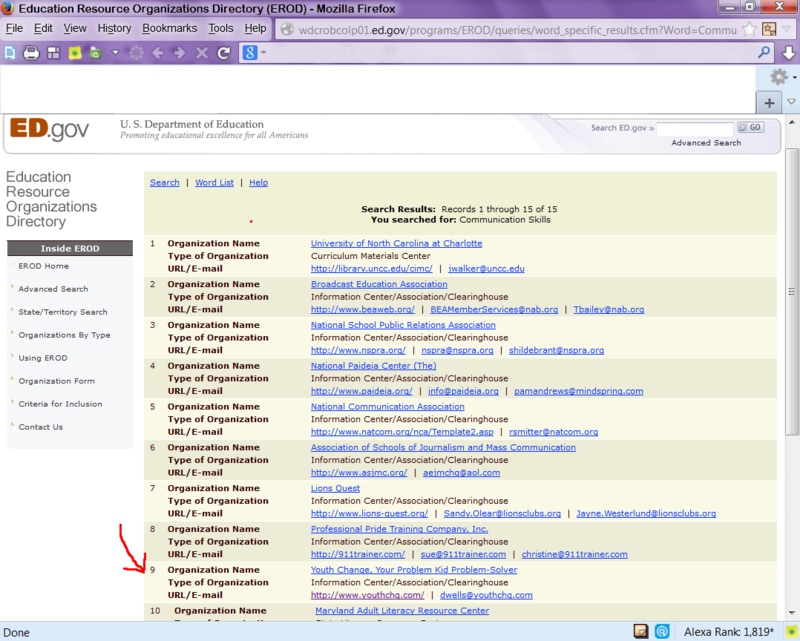 As shown at right, Youth Change Professional Development Workshops was ranked #9 for national educational resource organizations by the U.S. Department of Education in August, 2013. Click on image to enlarge it. 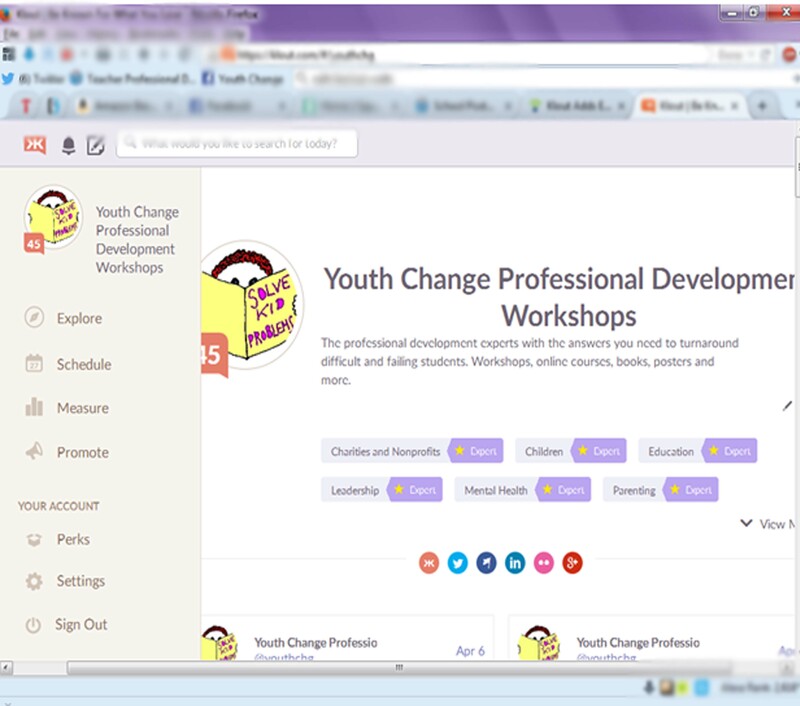 Klout.com, the experts on expertise, award Youth Change Professional Development Workshops expert badges during their initial roll-out of the badge concept. Click to enlarge the image. Note that you must have a Klout account to view details on Klout itself, but opening an account is free. Now you don’t have to take our word for it. Klout confirms that Youth Change is the nation’s leader for student behavior classroom management and professional development expertise.